The Dance Department offers complete dance education for ages 3 to adult in Tap, Jazz, Hip-Hop, Ballet, and Creative Movement (3 year olds). Classes begin in September and commence with our annual performance in June. Click here for the 2018-19 studio calendar. Please read all studio notices and emails throughout the year. Proper dance attire is required for all students. Students must have the required shoes and attire by October. 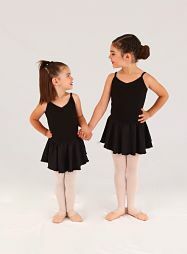 Tap & Jazz Classes - Leotard and tights, jazz pants, tap shoes, black jazz slippers or jazz shoes. Ballet Classes - Leotard, pink tights, pink ballet slippers or pointe shoes. Lyrical Classes -Leotard and tights, turning or pink ballet slippers. Modern Classes - Dance attire and no shoes. Hip-Hop Classes - Dance or workout clothes (NO JEANS), black jazz shoes or black dance sneakers. Male students - Black or white tee-shirt, sweat pants, proper dance shoes. Creative Movement Classes - Black Leotard, pink tights, pink ballet slippers. Ballet slippers must be a real leather dance slipper with a suede sole and elastic strap. Please do not wear bedroom style slippers that some stores sell as "dance slippers". Hair must be off the face and neck. Ballet students must wear their hair in a bun. No gum or jewelry allowed in any class! Sheer dance skirts maybe allowed at the teacher's discretion. A student may be moved to a different class if, after evaluation, the teacher finds that the student is not in the proper class for his/her ability level. We are excited to announce there is new dance bundle price packages for the 2018-19 Dance Season! Click here for all the details. Tuition for the year is payable in four installments. Please note that lessons are not refundable and make-up lessons are not given for student absence. Tuition payments are due September, November, February and April. A $20 late fee will be applied to any payments received after the 10th of the month. There is a $25 fee for returned checks. All checks should be payable to The Dance Department. To ensure proper credit, please put the student's name on the check. Pay for the entire year in advance and receive a 5% discount. Enroll in three or more classes and receive a 10% discount. No discount on private lessons or competition classes. Our annual recital is held in June. This provides students invaluable performance experience and a chance for students to showcase what they've learned throughout the year. All students participating in the recital are required to have a costume. The Dance Department and its teachers are not responsible for costume alterations. Please note that all payments are not refundable. Please make every effort to attend class. Please notify the studio in advance if you will be absent. Neither make-up lessons nor refunds are given for student absence. In the event of an extended absence, please discuss arrangements with your teacher. Make-up lessons are only scheduled in the event of two cancellations on the same lesson day, in which case one will be rescheduled. Due to limited studio availability, the make-up lesson will be scheduled on a weekend or during vacation week. To find out if classes will be canceled during inclement weather please call the studio at 518-371-1568. No other notification will be given. Classes may be held even if school is canceled! To avoid unnecessary travel, please call us in advance!